How Much Does It Cost to Develop WhatsApp? Messaging is one of the most essential functions that smartphone users want to have at hand. Even though there is WhatsApp and Viber, Snapchat and Telegram, people are constantly looking for what new messaging apps have to offer them. The mobile app industry gets more and more competitive over time, and users want apps that are cheap, fast, intuitive, and compatible across a range of different devices. Most of all, users no longer want to pay fees for SMS messages, demanding instead mobile messaging apps that work via WiFi or cellular network. Yalantis has relevant experience crafting different messaging apps with top-notch technology stacks behind them, and we want to share our insights with you. 1.Support for various data formats. Back in the days of SMS, phone communication was mostly about exchanging text messages. Today’s users want to be able to send texts and images, video, and audio files to each other. Most modern messengers support various file formats, as well as in-built camera and video functionality. The first question you will have to answer if you want to know how to develop an app like Viber is how to make your messenger support all the necessary file formats: text, images, video, URLs, documents (PDFs), spreadsheets. Creating short videos and using a set of colour and sound filters to make them more entertaining will increase your app’s popularity and will show that your messenger is not just about old and boring text exchanges. Implementing video recording and editing features in your app can be challenging and time-consuming, but Yalantis has some expertise in this area and therefore can minimize the time and expenses on developing these features. We also just finished developing Halaa, a great example of a voice messenger that lets users alter their audio recordings with sound effects and share them with friends and family. 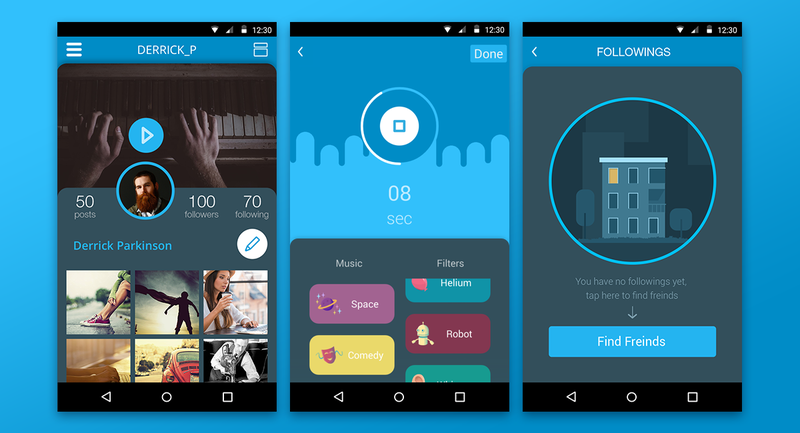 You should definitely read our case study on how to build Instagram for voice. 2. Synchronization with cloud services like Dropbox and Google Drive and services like Evernote. Users want their messaging apps to share documents directly from cloud-based services. self-destructing messages that disappear by themselves after a certain period of time. Highly rated secure messaging apps include Chatsecure, a free and open-source encrypted chat application for iPhone and Android; CryptoCat, an open-source encrypted messaging service available for internet browsers, Mac OS X and iPhone and, of course, the Telegram messenger. For users who are interested in maximum privacy, Telegram offers Secret Chats. Secret Chat messages can be programmed to self-destruct automatically on both participating devices. This way you can send all types of disappearing content — messages, photos, videos and even files. Telegram’s Secret Chats use end-to-end encryption to ensure that a message can only be read by its intended recipient. Scheduled or postponed messages are another useful feature that you can develop for your chat. This is a rare feature that is often underestimated, but your users will appreciate that they do not need a separate app to remind them about upcoming birthdays and anniversaries anymore! PostponePixel and Vochi – a user-friendly social messenger that we developed at Yalantis – are some of the few messengers to offer scheduled messages. These features are the most essential, but if you want to develop a messenger that will stand out and be successful, you need to consider other factors too. 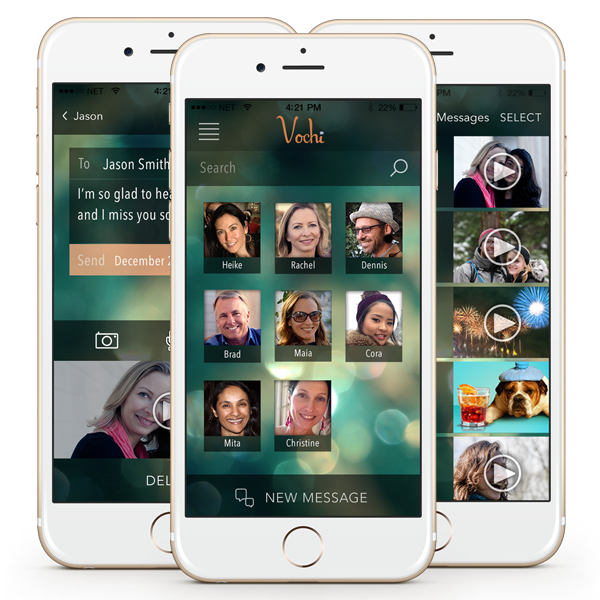 A new trend dictates that messengers should be entertaining as well as efficient and suggests combining video chat feature with video editing and special effects. Several big names like Snapchat got popular by providing a user-friendly solution that is all about entertainment. Recently, Snapchat paid $150M to purchase a Ukrainian startup Looksery. The Looksery app uses facial recognition and modification technologies to transform a user’s face in real-time while using the front camera on a mobile phone. With a range of facial filters, users can modify their faces and transform themselves into 3D-avatars while video chatting. 5. Event management and calendar. There is a growing tendency among users to opt for fewer screens and apps so it is a good idea to combine messaging features with additional functions like organisers and event reminders. There is not much point in trying to make a clone of a popular app like WhatsApp, so you should center your app’s idea around something unique. 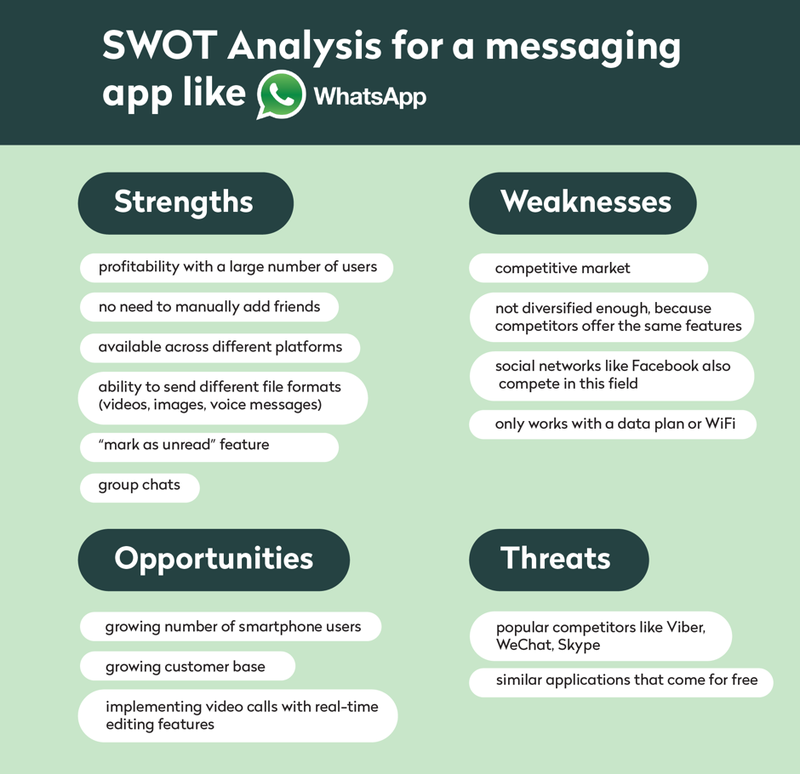 We summarized our findings in the table below that represents the SWOT analysis for a messaging app and suggests what features you should focus on. If you want to create a messenger app like WhatsApp you need to consider several key performance indicators: number of active users, retention rate, and user engagement. Let's see what you can do to increase them. 1. Number of active users. To grow the number of active users you should encourage people to invite their friends to use your messenger. Clearly understanding your app’s value proposition helps you to acquire more users. For example, Slack is a successful messenger because it markets itself as “a messenger for team communication that will make your life easier.” All Slack’s features are designed to help teams be more productive and exchange information faster and more easily. Other messaging apps specifically target groups of friends. If you want to develop an app like WhatsApp, you have to decide what your target audience is and show them how they will benefit from using your product. Another way to popularise your messenger is to create an app that combines instant messaging with hashtags and sharing through social networks. This is the way Twitter and Instagram work. Using hashtags helps promote your messenger through a greater number of channels. User acquisition is important but user retention rate is even more crucial for messengers. Let users synchronize your messenger with their phone contacts and send out notifications every time a new person from their friend list joins the app (Viber uses this feature). You may also remind users to congratulate their friends on special occasions like birthdays through push notifications. Introducing push notifications will draw attention to your app throughout the day and result in better user retention metrics. Messenger apps that are not just useful, but also entertaining, acquire more users. Making your app fun to use often involves working on design. Creating your own set of unique emojis or stickers can help you promote your app, especially among younger users. Gifs are trendy, but now we also have mojis – essentially short video clips of popular TV or movie moments that are great for personalising chats. Now that we have briefly looked into which KPIs you should consider if you want to create a messenger like Viber or WhatsApp, it is time for us to look into potential monetization strategies. How do messenger apps make money? If you grow your user base and get a lot of publicity your app will be worth much more and a big name tech company may notice your messenger. That is exactly what happened when Facebook bought WhatsApp for a mind-blowing $19 billion, or when SnapChat acquired the Looksery startup. That is why when you decide which revenue model your messenger app will use, it is also important to remember that there is one more strategy that is based on the long-term value of the brand and user base. This is why many companies make their apps free or only charge a small subscription fee. How much does it cost to develop a messaging app like WhatsApp? Considering all essential features a messenger should have, we made an estimate for the cost of WhatsApp – one of the most popular messengers out there. Our estimate includes versions for both iOS and Android, including design and backend. How do you develop a messaging app? What's wrong with open source Telegram? Want to know more about social apps?